Arsenal boss Unai Emery has revealed he was interested in signing Alexandre Lacazette when he was head coach of Paris Saint-Germain. The France international has been in fine form in 2018-19, scoring four goals in five Premier League starts and another in the EFL Cup win over Brentford. The 27-year-old struggled a little to settle following his 2017 move to the Gunners from Lyon but is fast becoming a key player in the new era under Emery. 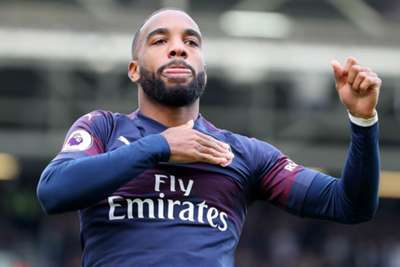 And the Arsenal head coach underlined his admiration for Lacazette by admitting he considered bringing him to PSG, despite boasting a luxury forward line of Neymar, Kylian Mbappe and Edinson Cavani. "When I arrived at PSG, we were thinking to sign Lacazette," Emery said ahead of Monday's Premier League clash with Leicester City. "His quality and his characteristics also we liked at PSG. Also, the people who were working there, they said to us, 'This player has the quality to play for PSG' when we were there. "He was at Lyon and it wasn't easy to have the conversation or to sign a player from Lyon. [But] he was an option for us." Despite Lacazette's impressive form, Emery insists there is room for improvement in his performances. "For him, last year, his first year in the Premier League, it was a different league than the French league also and the position also, the rhythm also, not the mentality because he has a very good mentality and he has very good chances usually to score. He is very efficient," Emery added. "But he needs to continue his adaptation for us, for the Premier League, for the rhythm. This year we are looking at him one step more in this level. "We are very happy but my message to him is: 'Every day, don't stop'. "Don't stop in training, don't stop in matches, carry on to find his best performance. Not even just in matches but in each minute of the 90 minutes and he is doing that."